Between 2005 and 2009, Stanley Works spent an average of $21 million per year on brand advertising resulting in unaided awareness over the time period growing from 27% to 48%. Between 2008 and 2009 alone, company officials yesterday said that brand awareness grew from 43% to 48% for the hand and power tool maker. "We’re trying to spend our money much more wisely and get the biggest bang for our buck so very little TV advertising, and then spreading it around several different areas," Executive VP & COO, Jim Loree said. In Stanley Works' Q4 earnings call, executives shared this slide on the value the company has derived from sponsorships. 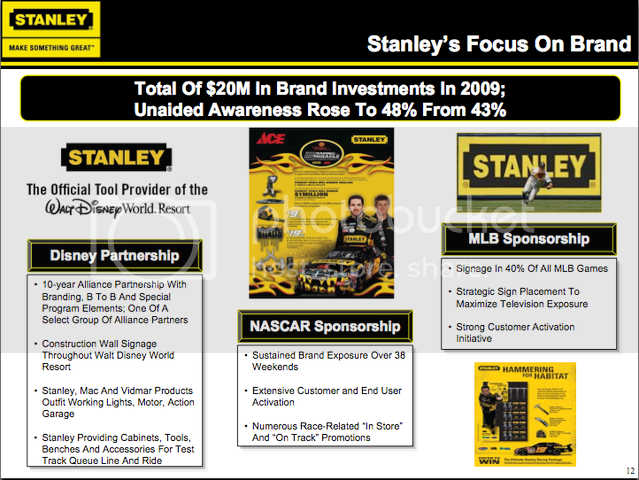 On the backs of MLB, Disney and NASCAR sponsorships, Stanley Works saw awareness steadily rise over the five year period with 27% unaided awareness in '05, 35% in ’06, 41% in ’07, 43% in ’08 and finally 48% last year. At its peak historical level in the early 80’s company officials said unaided awareness was 55%. "The latest initiative that we have is we have become the official tool provider of the Walt Disney World Resort and we have a partnership with Disney which is a 10 year alliance. It brings branding in the parks, B to B opportunities and other elements with a select group of alliance partners. We have construction wall signage throughout the Walt Disney Resort. Stanley, Mac and Vidmar products are highlighted in the Lights Motor Action garage. We’re also providing cabinets, tools, branded benches, cabinets and tools and accessories for the test track line area and the ride itself. So that’s very exciting and just getting underway. Of course we continue to be a Nascar sponsor. We have sustained brand exposure over 38 weekends with primary sponsorship in 20 races, extensive customer and user activation and numerous race related in store and on track promotions, and a very healthy menu for 2010. Last year’s big story for the brand awareness moving the needle was the Major League Baseball sponsorship. In 2009 we had 11 teams. We’re going to add one in 2010, thus giving us signage in 40% of all the games and we have really placed our signs strategically to maximize television exposure and we love and thank our Hartford neighbors at ESPN folks for their sports center coverage of our brand and its saturation that we get from all that exposure. And then of course last year we also began sponsoring the English Premier League which is the number one soccer league in the world and 650 million people around the world watch that every week and it’s an exciting initiative."